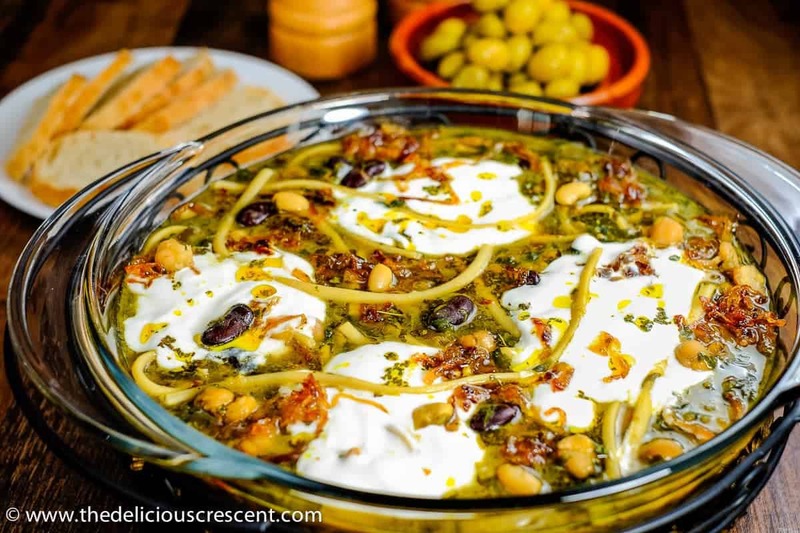 Persian Noodle Soup with Beans and Herbs – A classic Persian soup, intensely aromatic, lip smacking, nutrient rich and a wholesome meal by itself! This heart healthy soup traditionally known as Ash-e Reshteh, is perhaps the most popular Persian soup. This soup is appreciated at festive times but it is also served around the year. It is similar to the Italian minestrone, but the base is made up of well cooked herbs and greens rather than tomatoes. Ash reshteh is a sophisticated recipe that ingeniously uses a long list of ingredients, creating a captivating taste that will have you coming back for more. But don’t let the number of ingredients deter you from trying this much favored soup. You must check out this – not just for its taste, but importantly for the nutrition. It has the beans, the herbs, the greens, the grains – all steeped in spices and cooked together into a thick, creamy, rich soup! It might take you some time to gather the ingredients together. But that will be well worth the effort. And with the cooler months approaching – this healthy, invigoratingly tasty soup should be in your repertoire of recipes. One tip – it tastes even greater the next day! The amazing nutrition potential of this soup lies in the variety of beans and herbs used. In addition to that, the noodles complement the beans perfectly, thereby resulting in a complete protein, that would be on par with animal protein – so good for a vegetarian choice! Several research studies have demonstrated the potential of legumes (beans, lentils) in lowering the risk of heart disease. Talking about beans, you may also like this nutritious beany soup using chickpeas – Chickpea Barley Yogurt Soup. Kidney beans are an excellent source of protein, dietary fiber, B vitamins, folate and minerals such as molybdenum, manganese, potassium, copper, magnesium, iron and phosphorus. The slow digesting carbohydrates and high fiber content of these beans help prevent a rapid rise of blood sugar, and therefore are good for people with diabetes and insulin resistance. These beans are a good source of the cholesterol lowering soluble fiber. And the insoluble fiber present in the beans helps with stool bulk, prevention of constipation and certain digestive disorders such as – Irritable bowel syndrome, diverticulosis. Moreover, kidney beans are considered to be very heart healthy due to the high fiber content, folate and magnesium; among other nutrients. Folate lowers the levels of homocysteine – elevated levels of which are an independent risk factor for heart attacks, stroke and other heart diseases. 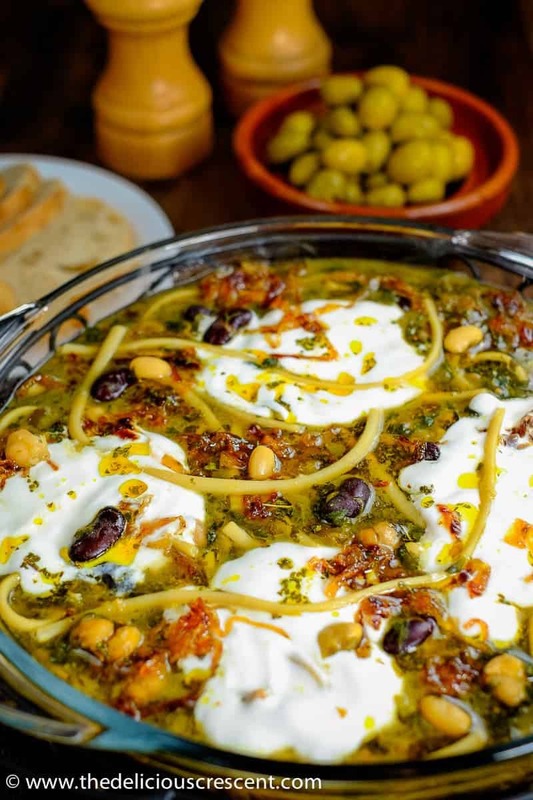 The herbs and greens further add to the rich vitamin, mineral and phytochemical profile of this wonderful Persian Noodle Soup with Beans and Herbs. Are you fascinated by fresh herbs? Then this easy recipe is for you to try – Tomato cucumber salad with fresh herbs. If you get yourself a bowl of this soup, you are not going to want anything more. A few crackers to crunch on may be. 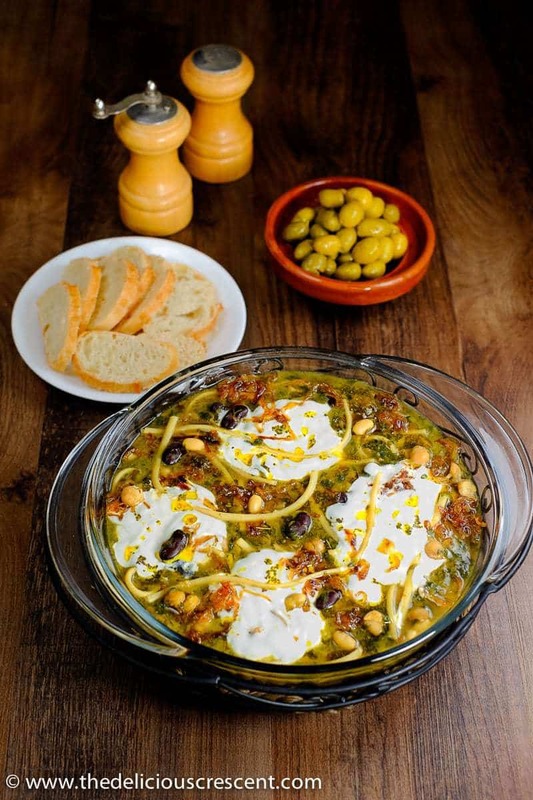 And now it is time to devour this warm, hearty, creamy delicacy – Persian Noodle Soup with Beans and Herbs!! Persian Noodle Soup with Beans and Herbs - A classic Persian soup, intensely aromatic, lip smacking, nutrient rich and a wholesome meal by itself! Make sure to use a mandolin slicer for thin onion slices. Heat the oil in a large cooking pot (5 to 6 quart) and sauté the onions with garlic over medium heat until golden brown, which may take about 20 to 25 minutes. Turn off the heat and stir the turmeric. Do not let it burn. Set aside one third of this onion and oil mixture. Mix the dried mint into it while still hot. Save it for the garnish. Add the beans (garbanzo, kidney and navy), stock, black pepper, paprika and salt to the large cooking pot and bring it to a boil. Reduce the heat to low setting and simmer it for about 30 or more minutes until soft. Then add lentils and cook another 15 minutes. Next add all the herbs and greens. Stir and let it simmer for about 20 minutes. Add more stock as needed to adjust the consistency of the soup. Take a few tablespoons of the soup into a small bowl and mix the ground oat/barley flour into it, making sure there are no lumps. Stir this back into the simmering soup. Add the reshteh or linguini noodles and cook for about 10 minutes until the noodles are done. Stir the lemon juice into the soup as per taste. Adjust the consistency, salt, lemon juice and other seasonings to taste. Stir some of the sour cream and the onion-turmeric-mint-oil mixture into the soup, saving some for the garnish. Ladle the Persian Noodle soup with Beans and Herbs into a bowl. Top it with dollops of sour cream and the onion-turmeric-mint-oil mixture. May serve some additional lemon slices/vinegar/sour cream on the side. Frozen chopped fresh fenugreek leaves can be found in Indian and Middle Eastern stores. Reshteh (Persian noodles) can be found in middle eastern stores or online. Traditionally a thick liquid whey known as Kashk is used for garnishing this Persian Noodle Soup with Beans and Herbs. But sour cream is an alternative. May use vegetable stock in place of lamb/beef stock. this looks so delicious :) i am loving all those flavour combinations that you have going on! This makes such a pretty presentation. Wish I could dive right in and try it! So happy you like it Jill. Hope you try it. This looks so tasty! My husband and I love to try foods from all over the world. Thanks for the tip on using the mandolin for the onions. I bet that makes it so much easier to get those beautiful rings. Yes, the finer onion slices help with better caramelization which is important for the taste of this dish. Thanks Leslie. Omgosh, this. looks. amazing!!! I love every ingredient listed and, together, it sounds like a flavor and texture party! Thanks for the inspiration! Thanks Traci, that’s so kind of you and very encouraging.